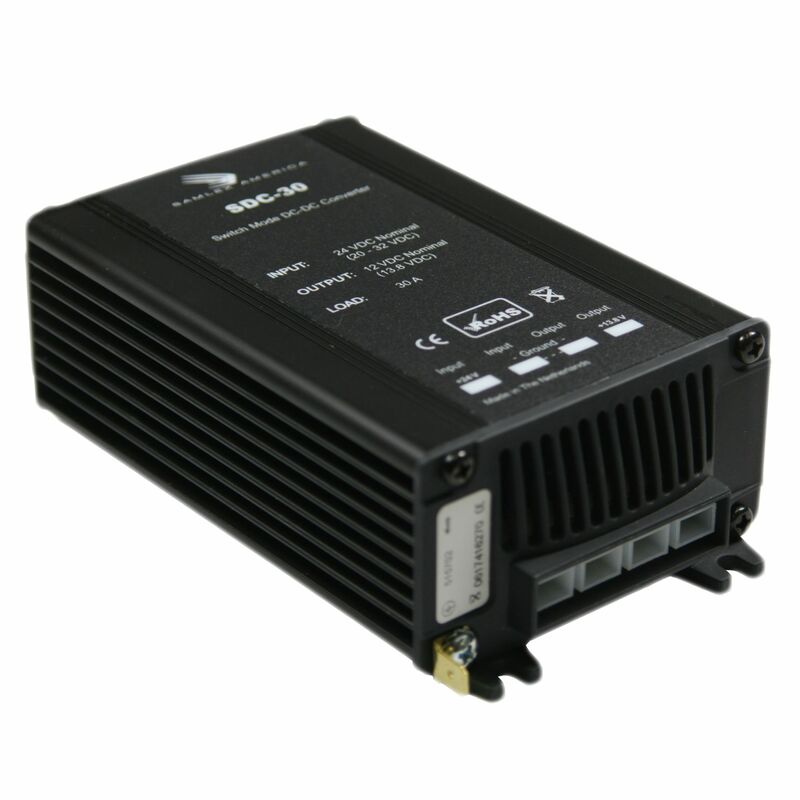 The Samlex SDC-30 is a high efficiency switch-mode step-down DC-DC converter. The SDC-30 converts an input voltage of 24 VDC nominal (range 20 VDC to 35 VDC) to a highly regulated output voltage of 12 VDC nominal (13.8 VDC) at 30 Amps. 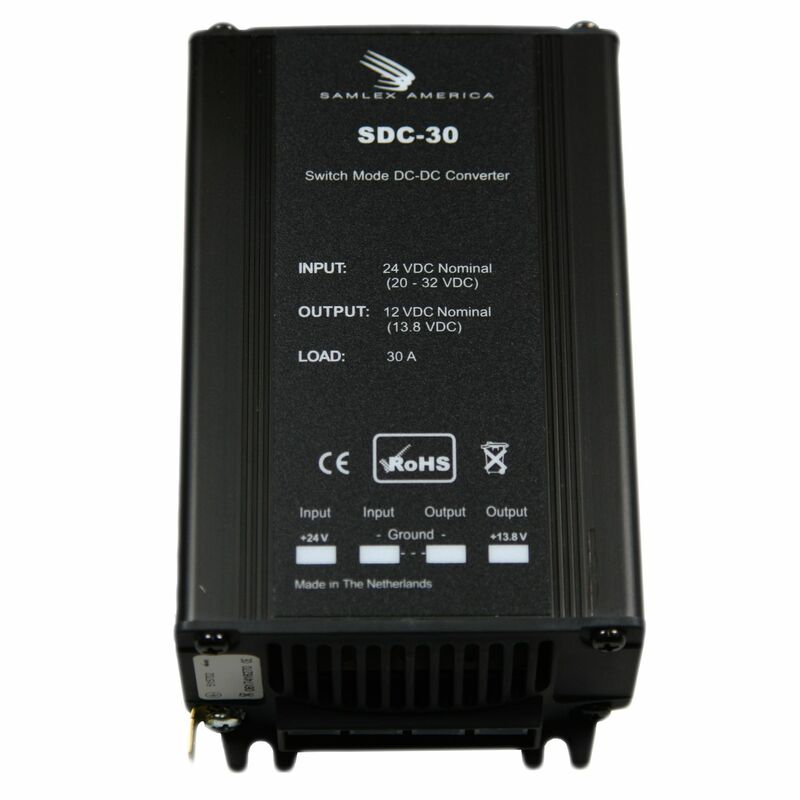 The SDC-30 DC-DC converter is non-isolated (no galvanic isolation between input and output) and meant for use in negative ground systems. Features include overload, over-heating, reverse polarity and over-voltage protection. Application examples include: Earth moving equipment Heavy trucks Buses Marine vehicles CB radios 12 Volt lighting systems AM/FM sound systems *Flat Rate shipping is for the lower 48 states only. Rated 3.50/5 Stars from 2 customer reviews. Do you own the SDC-30? Please, tell us what you think about it. It helps us provide you with better products. Please note that it may take up to 72 hours for your review to appear. Pros: This unit is small and compact it works great in the space where we installed it. It also seems to be fairly rugged. We like the units internal cooling fan, we were affraid we would have to design a cooling system for it. I also believe that the item was shipped the same day as I had ordered it. Cons: When ordering, I was not asked for a shipping address only billing. It was shipped to our unmanned fire station, the delivery company hung it on the door knob in a plastic bag. We installed this into a surplus military 5 ton truck that we are revamping into an off road firetruck. 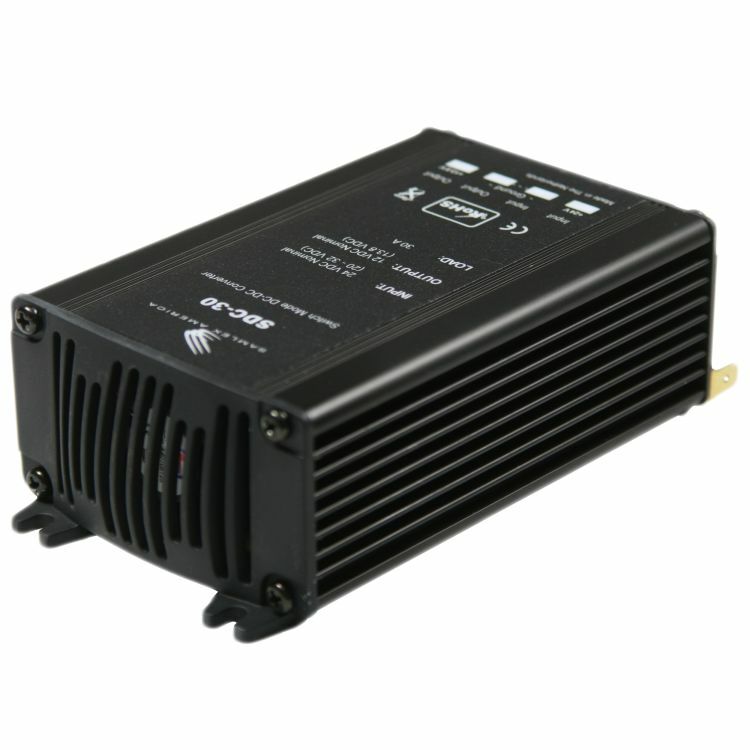 The trucks electrical system is 24V, we are running the 12V radio and siren with this unit. So far it works great, but we are not done with the restoration of the truck, and have not put it into service as of this review. Cons: connector tabs are too small to easily accept spade conductors, especially if oversized wire is needed. I'd prefer good screw-down lugs, big enough for 8 gauge wire. Computer-style pancake cooling fans may emit an irritating high frequency sound. I was double charged due to the item being on back order when I purchased it. When it finally shipped, the second charge was put thru. I got i all squared away with one phone call, but BatteryStuff needs to catch these things internally, BEFORE it gets to my credit card!